This gloious Belgian tapestry shows a Tree of Life design based on William Morris. 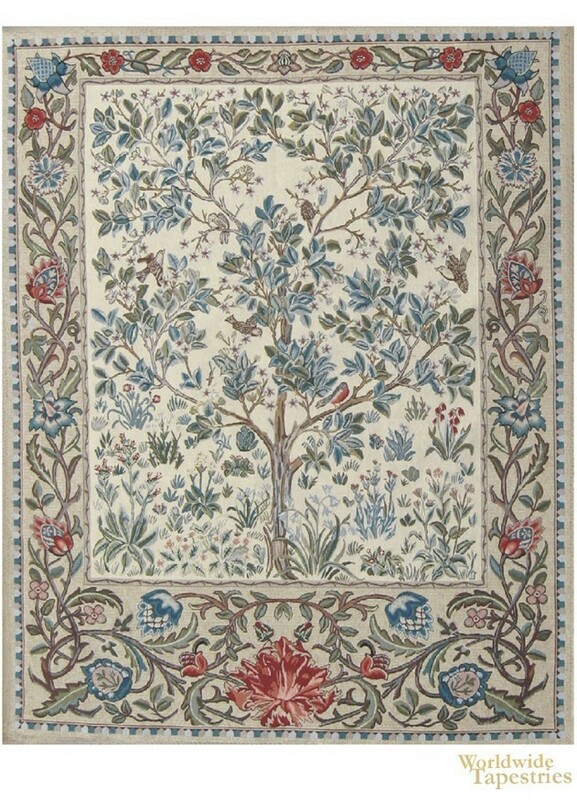 This tree of life tapestry shows the treee with elegant and stylish blue green leaves, among a flurry of activity of birds flying and hovering in the scene to capture a moment in nature as a crisp, clean scene to celebrate nature itself. The tree symbolises eternal life, life force of nature, the strength and beauty of nature and mother nature energy. In this piece, the reds and blues of the piece contrasts beautifully with the beige and browns. This wonderful "Tree of Life Beige II" tapestry is lined and has a tunnel for wasy hanging. Dimensions: W 19" x H 25"
Dimensions: W 22" x H 30"
Dimensions: W 27" x H 41"
Dimensions: W 34" x H 45"
Dimensions: W 52" x H 70"
Dimensions: W 70" x H 93"